dance.net - Emerald green Scottish Thistle dress for sale (10243378) - Read article: Ballet, Jazz, Modern, Hip Hop, Tap, Irish, Disco, Twirling, Cheer: Photos, Chat, Games, Jobs, Events! 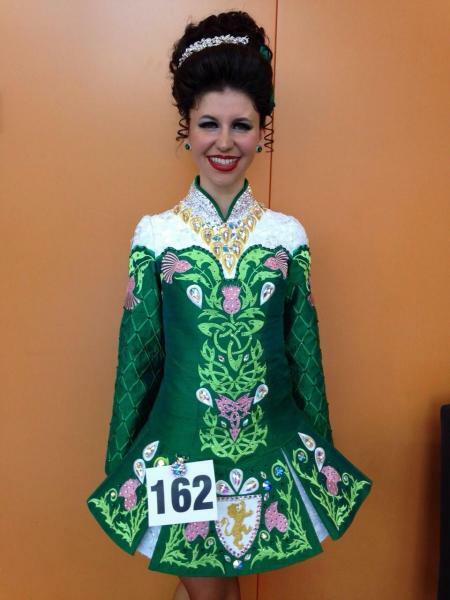 Elegant emerald green silk dress with pink thistle design made by Maureen Duffy for 2015 Worlds. Base is dupioni silk with white lace on shoulders and pleats. Underskirt is emerald green satin and tulle. Dress has been meticulously cared for and has no odors or missing crystals. There is plenty of let out/down in this dress as well. Slight bronzer stain on inside of collar, but not noticeable while wearing. Asking $1,500 or best offer. Returns accepted, buyer to pay all shipping costs. Please message me or email eduffy329@gmail.com with any questions or for more pictures.